UANYC is the first non-individual to receive the award. 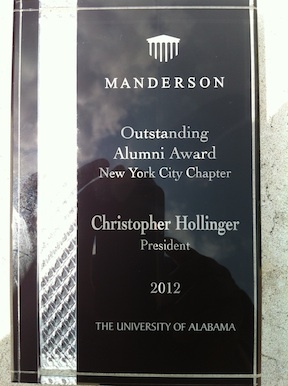 TUSCALOOSA, Ala. -- The Greater New York Chapter received its latest honor from the University as the Manderson Graduate School of Business tapped UANYC with its 2012 Outstanding Alumni Award. UANYC is the first non-individual to be presented with the award. Chapter President Christopher Hollinger accepted the plaque at the closing reception and awards ceremony of The Speaker's Edge program for the incoming class of MBA students. "Clearly, this award is a validation and recognition of the work our chapter members have done to support the dreams of MBA graduates who want to live and work in the New York City area," said Hollinger. "More importantly, this award emphasizes our goals to continue to grow as a chapter and to further strengthen our ties to the University." The Speaker's Edge is a part of a week-long orientation that requires the incoming class of MBA students to compete in two events -- one in team and one as individuals. The goal of the program is to improve the students' business skills in presentation, writing and analysis and build the students' confidence and abilities to be successful in the business arena.